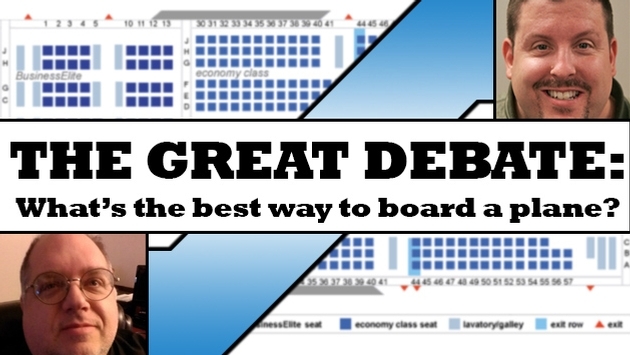 Great Debate: What's the Best Way To Board a Plane? News flash for all you first-class fliers – your seat is still going to be there. So is your overhead bin space. So sit tight in the gate area. Same goes for you too, you Diamond/Gold/Sapphire club member. But a new survey out only confirms what I’ve said all along and what the majority of seasoned fliers are familiar with – filling seats back to front is the easiest, most efficient way to board an airplane. The joint survey conducted by The GO Group and one of its subsidiaries, GO Airport Express, found that 55 percent found it the fastest and fairest way to board. "...a new survey out only confirms what I’ve said all along and what the majority of seasoned fliers are familiar with – filling seats back to front is the easiest, most efficient way to board an airplane." I’m not so sure the first class and business class and frequent flier members will think it’s the fairest, but when I’m boarding an airplane I’m not looking for pecking order; I’m looking for expediency. What my esteemed boss, Mr. Wood, is advocating is chaos. What I am trumpeting is at least controlled chaos. The survey was conducted in response to news that some airlines have been testing boarding from back to front as well as outside in, with window passengers first, then middle seats, then aisles. I experienced this outside-in phenomenon in March while flying Aeromexico. I wrote then that I found it somewhat efficient, and it was. But I still believe back to front is the best way. But there’s a curveball in all of this – carry-ons. One of the participant suggestions in the survey that I did like was requiring passengers to store their carry-ons only in the bins directly over their seats. Again, efficiency is the key here. Frankly, I’ve never understood some of the other ways of boarding a plane. The ‘zone’ method would be great if you were entering and exiting from multiple doors, but that’s a rarity. However, I do understand the baggage issue. No joke, I’ve seen near-fistfights break out over the overhead bins. And, well, full disclosure – in my youth, I might have been one of those travelers who chucked his carry-on into the first overhead bin I saw at the front of the plane so I didn’t have to lug it to the back and then back up to the front again upon landing. Yes, I still believe in fairness. And the fairest and most efficient way is to board back to front. I don’t care about efficiency when it comes to airline boarding. There, I said it. I am already being subjected to a government-approved, spiraling-out-of-control financial pillaging when I get on an airplane. Everything that used to be included is now a fee. Want to bring luggage on your vacation? Pay $25 per bag – because of course, that makes perfect sense. Bringing luggage on vacation is a privilege, and for that right, we should be charged extra. Want to have enough room so you don’t lose circulation to your legs? That’s another $20 to $60, depending on how long the flight is. All the while, the seat widths are getting smaller. And I’m not getting a refund for that, am I? 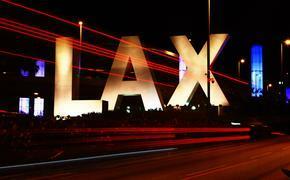 Want to change your flight? That will be $200, sometimes more than the cost of the original flight. No reason, really. It’s more of a “because we can screw you any way we like” fee. "Getting on the plane first takes away stress and partially quells my urge for anarchy as the airlines squeeze every dollar and every sense of basic luxury out of flying for the everyman." Oh, you want to complain about the fee? That’s another $50. I joke there, but if the airlines can find a way to pass on the costs of staffing folks to listen to our complaints, they will. Airlines have been one of the most inefficiently run businesses for the last half century. Now, they’re scoring record profits by turning basic conveniences into privileges. And the airline lobby is so powerful that they even have some idiots in Washington believing that they shouldn’t have to list all the fees when showing fares. They’re all in cahoots – Washington is creating bogus taxes to add on to fares to try and cut the national debt. And the airlines, seeing that Americans are still flying, are joining in – constantly pushing the line to see how much they can get away with. So if I’m paying extra money for luggage, for enough room to not get a blood clot and to subsidize politicians who can’t balance a budget, I want on the plane first. Efficiency is not a “me” problem. It’s an airline problem. They have created this class system and all these extra fees. They have conditioned us to feel like boarding first is a privilege and made us pay for it. Yes, I want to leave on time. But again, that’s on the airlines. Rich has a point on the overhead bins. Simple solution: Put your bag in the bin over your seat. If you try anything else, you’re kicked off the plane. That will save 10 minutes per flight right there. You’re welcome, airline industry. Or better yet, charge a fee for the right to put your bag anywhere you like. If the airlines start making me wait longer in boarding areas with six seats for 150 passengers and one working plug (if you’re lucky), I want money back. You think the airlines will ever give up those fees? Keep dreaming. Getting on the plane first takes away stress and partially quells my urge for anarchy as the airlines squeeze every dollar and every sense of basic luxury out of flying for the everyman. Rich knows this feeling, he wrote a column about it. Change the seating structure and airlines will have to completely rethink their idiotic status system. Again, not going to happen. Take that away and you might as well just do what our colleague Barry Kaufman suggested: line everyone up 100 wide on a baseline, blow a whistle and watch the chaos as everyone scrambles to get to the gateway first. I don’t know why I even type these things. Somewhere, there’s an airline executive who will think that’s pure genius. What are your thoughts on the great debate? Do you think efficiency trumps fairness? Do you have an even better idea for boarding a plane we didn't cover? Let us know by email, editorial@travalliance.com.